The Market Value of the “Organic” Image Questioned. 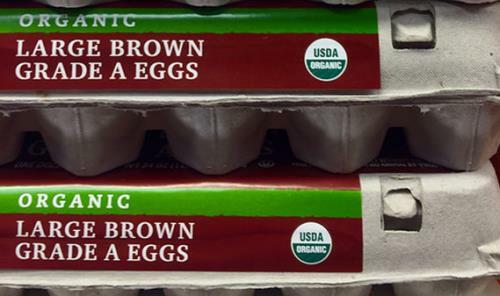 Use of the term "organic" on labels is confined to products grown, reared and processed in accordance with the requirements of the National Organic Program (NOP) administered by the Agricultural Marketing Service of the USDA. In contrast the term "natural" is not regulated but motivates purchase decisions by 53 percent of consumers in a recent Label Insight survey of 1,000 shoppers. Other label claims that attract consumers include "antibiotic-free" and "no-preservatives". Apparently the attractiveness of the "clean label" is directly proportional to age. As with many narrow-focused surveys the results depend on how the questions are framed and the specific knowledge of the product attributes including the definition of any claim and an appreciation of the significance of an additive. Surveys have shown an almost total opposition to inclusion of "dihydroxy oxygen" (water) or DNA (ubiquitous) in food. The Label Insight study apparently made no attempt to consider trade-offs including how much consumers were willing to pay for products free of additives and antibiotics compared to generic alternatives. An obvious case in point is that a high proportion of consumers disfavor confining hens in cages but only a subset of the population are willing to pay a differential for non-confined housing systems including barns and aviaries. If the NOP and the Organic Trade Association wish to enhance the image and hence volume of sales of USDA-Certified Organic products they will have to develop a brand approach for their category. This will require a check-off program with promotion analogous to the American Egg Board and other statutory commodity groups including milk, beef, and pork. The fact that any manufacturer can apply the non-defined and vague term "natural" to labels and elicit a positive response suggests that the NOP with a disproportionately regulatory and production orientation, is neglecting promotion and consumer education. This calls into question the value of the USDA Certified Seal that incurs a considerable incremental cost of production. Perhaps in the case of eggs that are by nature "gluten-free" and in the U.S. are produced without "hormones and antibiotics" are in no way inferior with respect to nutritional value or quality than more expensive Certified Organic product with a price differential of up to $1.50 per dozen. There is a small segment among consumers who actively search for the organic label and are willing to pay a premium over generics. That segment appears to be small and static in size as denoted by the fact that hens under the Certified organic program have remained at approximately seven percent of the national shell-egg flock for close to a year.